MOTOR racing fans across the Shoalhaven will be revved up by the news that the region now has a motor racing team it can call its own. 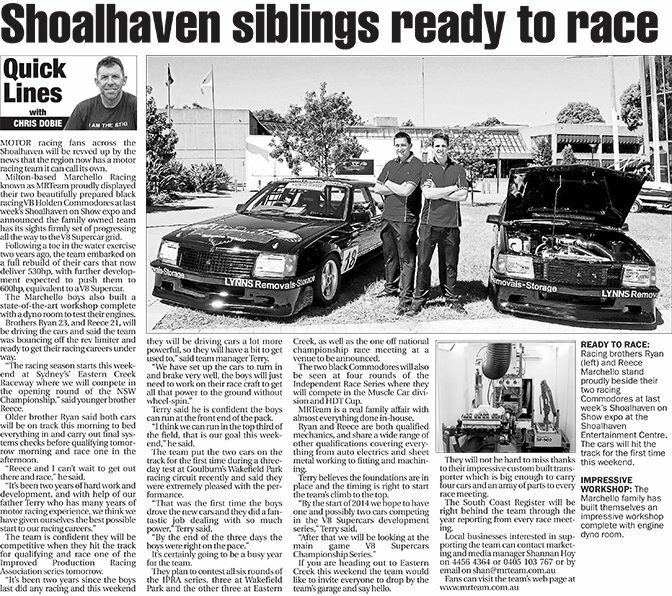 Milton-based Marchello Racing known as MRTeam proudly displayed their two beautifully prepared black racing VB Holden Commodores at last week’s Shoalhaven on Show expo and announced the family owned team has its sights firmly set of progressing all the way to the V8 Supercar grid. Following a toe in the water exercise two years ago, the team embarked on a full rebuild of their cars that now deliver 530hp, with further development expected to push them to 600hp, equivalent to a V8 Supercar. The Marchello boys also built a state-of-the-art workshop complete with a dyno room to test their engines. Brothers Ryan 23, and Reece 21, will be driving the cars and said the team was bouncing off the rev limiter and ready to get their racing careers under way. “The racing season starts this weekend at Sydney’s’ Eastern Creek Raceway where we will compete in the opening round of the NSW Championship,” said younger brother Reece. Older brother Ryan said both cars will be on track this morning to bed everything in and carry out final systems checks before qualifying tomorrow morning and race one in the afternoon. “Reece and I can’t wait to get out there and race,” he said. The team is confident they will be competitive when they hit the track for qualifying and race one of the Improved Production Racing Association series tomorrow. “It’s been two years since the boys last did any racing and this weekend they will be driving cars a lot more powerful, so they will have a bit to get used to,” said team manager Terry. Terry said he is confident the boys can run at the front end of the pack. “I think we can run in the top third of the field, that is our goal this weekend,” he said. The team put the two cars on the track for the first time during a three-day test at Goulburn’s Wakefield Park racing circuit recently and said they were extremely pleased with the performance. “That was the first time the boys drove the new cars and they did a fantastic job dealing with so much power,” Terry said. It’s certainly going to be a busy year for the team. They plan to contest all six rounds of the IPRA series, three at Wakefield Park and the other three at Eastern Creek, as well as the one off national championship race meeting at a venue to be announced. The two black Commodores will also be seen at four rounds of the Independent Race Series where they will compete in the Muscle Car division and HDT Cup. MRTeam is a real family affair with almost everything done in-house. Ryan and Reece are both qualified mechanics, and share a wide range of other qualifications covering everything from auto electrics and sheet metal working to fitting and machining. Terry believes the foundations are in place and the timing is right to start the team’s climb to the top. “By the start of 2014 we hope to have one and possibly two cars competing in the V8 Supercars development series,” Terry said. If you are heading out to Eastern Creek this weekend the team would like to invite everyone to drop by the team’s garage and say hello. See your ad hereThey will not be hard to miss thanks to their impressive custom built transporter which is big enough to carry four cars and an array of parts to every race meeting. The South Coast Register will be right behind the team through the year reporting from every race meeting.